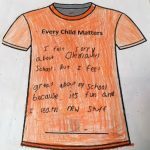 On September 29th, students at Nelson Elementary wore orange t-shirts to bring awareness about residential schools and that Every Child Matters. In division 8, students read the story “When I was Eight” and “Not My Girl”. This story is about Olemaun who goes to a residential school. After reading, students compared Olemaun’s experiences at her school to their own feelings about school in Grade 3. Please visit our hallway to see your child’s work on the bulletin board.